What: It's pretty clear why we all love a little hair of the dog at brunch: it works. And if you're partial to brunch drinks, there's nowhere better than Maison Premiere, the elegant Brooklyn absinthe and oyster joint styled after the New Orleans of yore. Here, you'll find brunch sips made with the precision of any craft cocktail today—a Mimosa done right, a Bloody Caesar with spices and fish stock, and more unusual options like a Chandelier Flip with ruby port, the herbal liqueur Becherovka, cognac, a whole egg, and Angostura whipped cream. 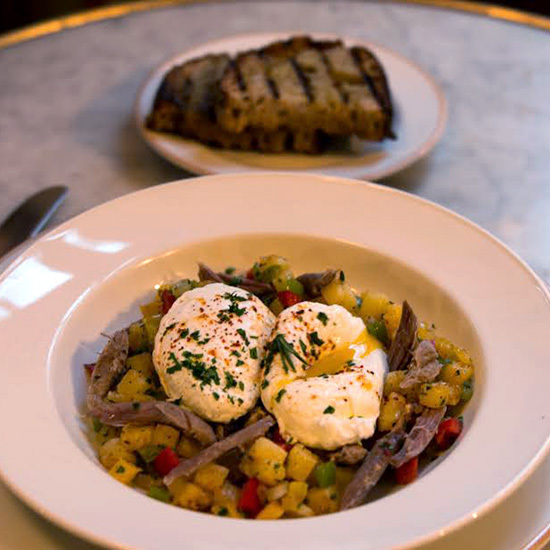 And to eat: Hash is as good a belly-filler as hangover cures get, and the Duck Hash Pimentón delivers, with ample smoked paprika and a gently poached egg.